Great idea, Evan! I think we could definitely benefit from this! Thanks, Terri. This is something that I really want to see happen in 2014 for us in the K12 space. So much potential for a common hashtag system to benefit inquiry-driven learning, and build global minds. I could see myself checking other countries common hashtags as well as a way to deepen my students learning. Nice graphic. Thanks for sharing. wow! thanks for sharing. I had just thought of hashtags as somewhat silly things up until reading this. I will reconsider. Still seems like a lot of work (cataloging the internet) but willing to give it a try. There are already a lot of educators using hashtags to connect with other educators based on their interests. #edchat, #edtechchat, #2guysshow, ect. I have seen fantastic spreadsheets with a collection of all of the education related hashtags. There are also a lot of excellent blog articles out there with some of the more widely used hashtags. I recently even saw a spreadsheet with a list of all of the teachers using Twitter with their classes. The first step is to connect with other educators that are teaching the same content as you and create the common hashtag. Some will stick, some will not. The first step is just getting the name of the hashtag out there so that others can begin to use it. What comes after that is entirely up to us. Start with one hashtag and go from there. You’ve definitely given me food for thought as I look to start planning for next semester. I use class hashtags regularly, but maybe now it is time to start including more general ones in course content. I currently find, though, that it is only the more academically-driven students that go out on their own to find and use hashtags. Perhaps this is a trend I can help change in the new year? This idea may be a rethinking of how hashtags can benefit us. In order for it to be successful it will require educators working together to forge common hashtags for their standards/content/subject areas. From there it will take teaching the students how to tap into this power. That’s why I recommend starting them young by using teaching guided lessons. At the elementary school where I work morning calendar is a widely used lesson. A common hashtag would make connecting and thus finding other teachers that were using morning calendar as a lesson. The teacher could not only use the common hashtag to connect with other teachers that were teaching the exact same thing, but they could share weather, favorite color of the day, you name it. The lesson also begins to teach the young learner about social media and how when used responsibly that it can lead to the betterment of our global community. Thanks, Evan! As an “old-timer” teacher educator keenly aware that I need to lead my pre-service teachers to incorporate social media in their lesson planning, I appreciate the leg-up this post provides. My first step this spring will be to require all my Reading I students to get a Twitter account. Then we’ll learn together how to use hashtags. Who knows where we go from there! I have found that the best way to lead the social media charge is to model how to use it for professional gains. I would showcase the positives that being a connected educator has made for you. But be careful not to push your colleagues too hard. I would also recommend not making a Twitter account a requirement for your students. What I would do is create a class account and begin connecting with other classes that use Twitter. 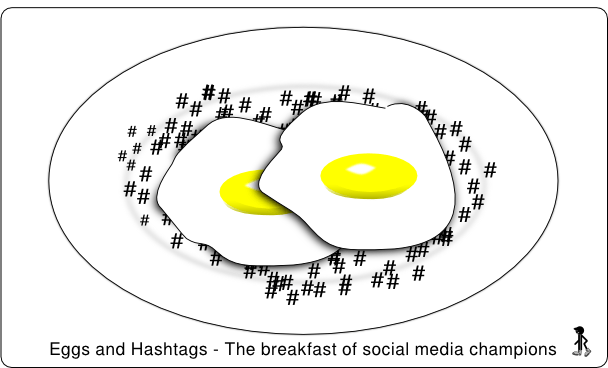 Connect with other educators ahead of time and decide what common hashtags you would like to use. Then model how to use Twitter to your students. I also highly recommend involving your parents in this. Many parents will not like that you required their child to have a social media account. By involving your parents you show a willingness to work together and that you are willing to listen to their concerns. While there is a lot of power for learning with social media use there is also a lot of potential for misuse. Good luck and keep me posted on your progress. Thank you, Jose. And thank you for sharing your class website. Looks like you’ve got a lot of great projects going on in your class. I’d love to collaborate some time. Let me know what you have in mind. It is a bit of a phenomenon that they haven’t taken off more, in the K-12 arena as you discuss. I suspect the reason why is that educators are nervous about using them with students due to the privacy issues. I’m not a proponent of filtering, in general, but the open end of a hashtag on Twitter is a little scary when we’re talking about little ones doing the searching. For instance, the Japanese girl posting a semi-questionable photo that you mentioned above. I use them all the time, as a former teacher and now instructional technology consultant, but when using them with students I think I’d be a little more hesitant to have them exploring openhandedly. Just a thought…thanks for sharing your post. Thanks for your comment. I believe that there are ways to still protect student privacy and use a common hashtag system. All in all I believe that we have reached a point where education needs to take on more of an active role in teaching social media responsibility. I don’t think I would just let a young student go off and use social media without there being a lot of teaching first. As an educator, I also would not ask students to search a hashtag without first having done so myself. The goal of a common hashtag system in education would be to create connections and teach global mindedness. There is a lot of untapped potential in using social media as a learning tool. There are safe and educationally sound ways to make this happen. I know that I would love to begin having those conversations with other educators and stakeholders out there.